Andrew Neil and Tim Iredale are joined by Nigel Farage, MEP. The Political Panel consists of Janan Ganesh, Julia Hartley-Brewer and Steve Richards. Browse content similar to 29/01/2017. Check below for episodes and series from the same categories and more! mainly Muslim countries sparks protests at several US airports. and why it doesn't apply to everybody. They'll be tweeting throughout the programme. where refugees are banned from until further notice. on all refugees coming to the US for the next 120 days. of voluntary schemes to bring Syrian refugees into the country. to understand precisely what the implications are. understand it, and then will respond to that. pressure to respond within a news cycle and so on. and it was affecting ordinary citizens and some British citizens. this, given that there can be exceptions on a case-by-case basis? right place. Thank you for joining us. to prepare, she can get it totally right and sometimes more than right. wrong before and I think it will be proven wrong big-time in this case. President Carter. He did it in the aftermath of the Iranian crisis. says something on the record. She would get away with it indefinitely. the air. She flew from Washington to Ankara, than from Ankara to London. the new US President for his "stunning election victory"
into this country. If they can be defined. Mr Trump won't let any in. and that's why the Trump visit suddenly things brings into focus. agree that she's trying to get from your point of view the right things. fight Stoke Central who has described Brexit is a pile of notes. so moving some money from them to us. of care homes which have had to close down. The Government is absolutely committed to getting this right. helps councils learn from each other to raise standards. Back in Beverley, Pat McGuire is not convinced. I can only believe that it is going to get worse. that need far greater care then many people who are just frail. where that is not the case. I do agree that has got to be a solution. Union, your neighbouring MP came up with a bill that would do just that. they will be enshrined in UK law when we leave the European Union? guarantees for industries in Holby able to access the European market. It is about jobs and investment in the city. -- industries and Hull. that because that is a huge amount to do. A huge amount. -- we will be. Brexit from them or not? Many of the industries... I most certainly am. those Millwall fans. Thank you to Martin Vickers and Diana Johnson. on refugees and citizens from seven mainly Muslim countries. and he is not due to come until summer. But there are three bands. There is the 90 day ban on people coming from the southern countries. 1975. There were all over the place in terms of the single currency. will resign. We shall find out this week. I'll be back here on BBC one next week. 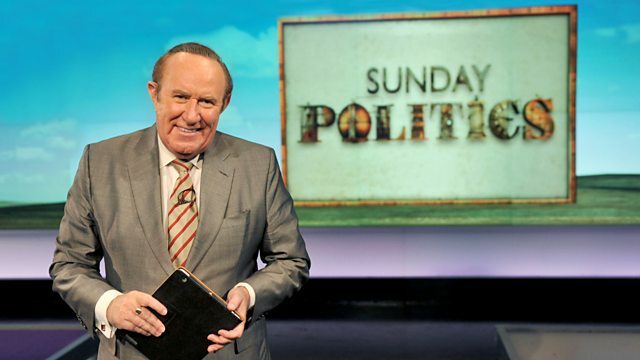 Remember - if it's Sunday, it's the Sunday Politics. a free five-a-side tournament that's for everyone. For more information, go to the Get Inspired website. Andrew Neil and Tim Iredale are joined by Nigel Farage, MEP. The Political Panel consists of Janan Ganesh of the Financial Times, Julia Hartley-Brewer of talkRADIO and journalist Steve Richards.